This road trip is a photographer&apos;s dream! Amidst the Talkeetna and Chugach Mountains, the Glenn Highway parallels a path carved by the ancient Matanuska Glacier, where the braided Matanuska River now flows. 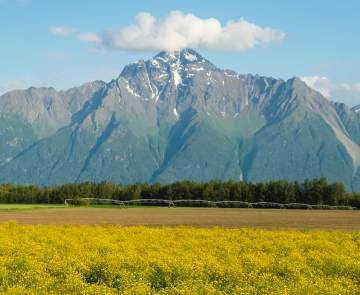 This self-drive itinerary forms one big loop around the Mat-Su Valley, following the Glenn Highway northeast to the Richardson Highway, north to the Denali Highway and west to the Parks Highway. From there, turn north to Denali National Park or south and return to the Mat-Su Valley. At least two or three days are recommended for this scenic Alaska drive, although you may wish for a lifetime. 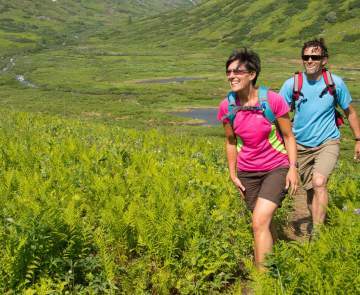 Highlights include historical Alaska roadhouses, mountain lodges, sumptuous dining with world-class views, lake fishing, glaciers, activities and countless scenic viewpoints. Lodge and campground hosts often share hidden mountain lakes, secret berry picking spots, fossil finds and wildlife viewing tips to enhance your adventure. Check out the Vacation Fundamentals for Alaska tour companies that offer flightseeing, backcountry and ATV adventures in Glacier Country. From Anchorage: travel the Glenn Highway (Alaska Route 1) through Palmer, toward Glennallen, Alaska. From Wasilla: Connect with the Glenn Highway in Palmer through the Palmer-Wasilla Highway. Enjoy the ride and the incredible scenery. There are plenty of pit stop opportunities for hiking, river rafting, geology, wildlife viewing, glacier exploring, photography and more. Mile 61.6: In Sutton, turn north on Chickaloon Way to explore coal-mining remnants at the Alpine Historical Park. Overnight camping is available at King Mountain State Recreation Site (Milepost 76). Mile 76: Take a thrilling white water raft trip down Matanuska River. Adventures are perfect for both first-timer and experienced outdoor enthusiast. If fishing is what you have in mind, several roadside lakes are stocked with rainbow trout and grayling. Ravine Lake (mile 83.2), Long Lake (mile 85.4), Wiener Lake (mile 87.4) and Knob Lake (mile 119) have ample shoreline, so a boat is not necessary. Would you like to walk on a glacier? Ever dreamed of getting married on a glacier? 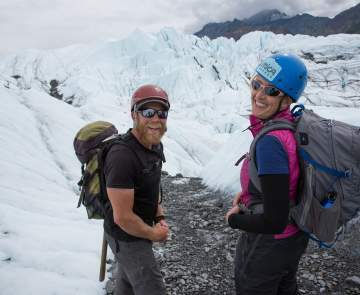 You can do both at Matanuska Glacier - the largest Alaska glacier accessible by car. The glacier flows majestically out of the pristine peaks of the Chugach Mountains, beneath the towering Mount Marcus Baker (13,176 ft). During the Naptowne Glaciation, 20,000 years ago, the Matanuska Glacier extended all the way down to the Matanuska Valley. About 10,000 years ago, it began to retreat to its present day location. The glacier was first photographed by W. C. Mendenhall in 1898, and since that time there has not been significant movement. Road access to the foot of the glacier is available for a fee at Glacier Park Resort, located at mile 102. Guided hiking and ice climbing tours can be also be arranged, as well as camping opportunities nearby. Mountainside lodges and restaurant facilities dot the highway from mile 99 to mile 115, including Matanuska Lodge, Long Rifle Lodge, Grand View Cafe Cottages & RV Campground, Sheep Mountain Lodge and Majestic Wilderness Lodge. Mendeltna Creek Lodge at mile 153 offers cabins, RV and tent facilities and groomed wilderness trails. Mile 106: Mountains and rivers in this area offer recreational fun for rock hounds, fossil hunters and gold panners, especially in the mineral-rich Caribou Creek area. The Caribou Creek Recreational Mining Area features a well-maintained hiking trail that takes you down to the edges of Caribou Creek, a good place for gold panning. There are also picnic sites from which you can occasionally observe Dall sheep, moose and bear. The Sheep Mountain Dall Sheep Reserve begins just past Caribou Creek Bridge (Mile 106.8), to the north of the highway. Dall sheep are often low enough on the mountain to be seen without binoculars. Best months for viewing are late May, when new lambs can be seen, through mid-September. Mile 116-118: The National Audubon Society recognizes this area as a major migratory path for hawks, eagles and other raptors. Local birders come to this area approximately the third week of April to catch this major event. Visit the Lake Louise Recreation Area (turn off at mile 159.8.) for lake trout fishing, views of Tazlina Glacier, snowmobiling and cross-country skiing. Lodging, including Lake Louise Lodge and The Point Lodge, a campground and public boat launch area are available. Mile 189: Turn north on the Richardson Highway (Alaska Route 4) approximately 70 miles north to Paxton. The highway winds through the foothills of the Alaska Range, offering magnificent views of the Alaska Range, Wrangell Mountains and Chugach Mountains on clear days. Turn west onto the beautiful 135-mile Denali Highway (Alaska Route 8). This road "less traveled," features some of Alaska&apos;s most beautiful backcountry vistas outstanding, as well as fishing and hunting, berry picking, wildlife and birding opportunities. Remote lodging is available along the way, although advance reservations are always recommended. The Denali Highway is mostly a gravel road and is closed October through May. At the junction of the Parks Highway (Alaska Route 3) travel north to Denali National Park or south to Denali State Park for a variety of overnight lodging options.